Many homes have DVR security systems installed on their property. 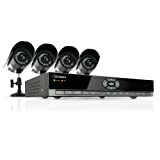 These systems are technologically advanced, and they can stream live to a monitor inside the house or at a remote spot as they record on the DVD. More complex systems are often used to protect large estates and expensive properties. The cameras can be set up in areas on the property near entryways to the home. A camera may be set up at the driveway entrance, another at the top of the driveway, and others around the house. Some systems allow the homeowner to monitor their home even when they are away with a distance monitoring system. Before purchasing a DVR security system, it is necessary to know how much protection is needed for your property and home. Round-the-clock monitoring is available, and it is also possible to monitor only at certain times of the day, such as when no one is at home. It is also necessary to look into systems that are wired and those that are wireless to have an idea of which would work best for the property to be protected. The right security system can give you peace of mind in knowing that no one is on your property when you are home, or if you are away. Hidden network cameras provide the best security because intruders may not see them. It is important to remember that if the cameras are visible, they may be pulled down or destroyed by the intruder. Some DVR security systems have high resolution indoor-outdoor night vision surveillance cameras that take very clear photos, regardless of the time of day. Other cameras have a pan tilt function that is capable of taking wide photos. Dummy security cameras are another option that can be installed in certain areas to provide the look of additional monitoring. Where to place these cameras is often a decision that professionals can advise the homeowner on, based on their experience in the security field. Smaller homes with a small to medium-size yard may want to install a two camera mini DVR security system. Two additional cameras can often be added to these systems that have Internet and 3G mobile viewing, as well as USB backup, mouse, firmware upgrade, and image transfer. A system like this costs around $600 with two cameras, not including installation. There are other highly rated systems that cost less. One is priced around $450, and it has four indoor-outdoor high resolution night vision cameras. Some of the benefits of this bundled package are that it can record over a month of footage, and it can also access the live video footage on an iPhone or Blackberry Smart Phone. Owners of large homes and estates usually contact professional security companies to install systems on their property, rather than choosing a system and installing it themselves. This is probably the best way to ensure that large properties are protected because hidden cameras are usually required at various spots on the property. Large homes are often the most targeted by thieves and intruders, and professional security companies know how to provide the best security. These security systems may be installed in various ways. A professional security company will install their equipment on your property. They charge a fee for this, but you will eliminate a lot of work if you pay to have it done, and you will know that the system was properly installed. 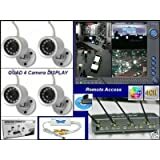 You can save money and buy your own equipment here on DVRSecuritySystem.com and either install it yourself or hire someone to set it up for you. It is also possible to have professional equipment installed on your property that is monitored by the security company, rather than by you. If any unusual activity occurs on your property, they contact the police immediately. Another possible way to install the system is to purchase it yourself online. There are many systems available that you can install yourself, or there are installers who will place the device where you want it. Regardless of how the system is installed, it will provide a lot of security for homeowners and their families.